Using a Chainsaw Safely | Gold Eagle Co. Homeowners routinely overlook the dollar value associated with their property’s shrubs and trees. A well-maintained tree or hedge can add thousands of dollars to your property’s value and can save you almost as much in maintenance fees. Unfortunately, it doesn’t take much more than a stroll around your neighborhood to find a plethora of trees in some state of neglect. This is big business for your local tree service company, but a huge expense to homeowners. With that being said, a basic familiarity with the chainsaw and its implementations in the scope of your yard work can translate into big savings. 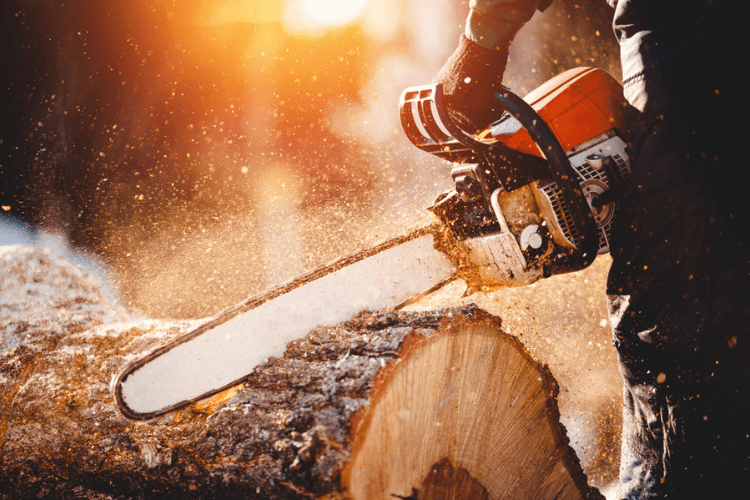 Here are the basics of chainsaw use and safety to get you started on tackling some of your nastiest backyard brush projects. Chainsaws are dangerous. Simple familiarity with their use isn’t a sufficient replacement for always wearing the proper safety equipment and learning from an experienced instructor. Users should always be wearing ear, eye and head protection when operating chainsaws. The last, and arguably the most important piece of safety equipment is a set of chainsaw chaps. Chaps are worn around the front of the user’s legs and are filled with a fibrous filling that binds up the chain and bar in the event of the saw coming into contact with your leg. Despite their effectiveness, it’s best not to test them yourself, and instead become familiar with the following chainsaw standard uses. 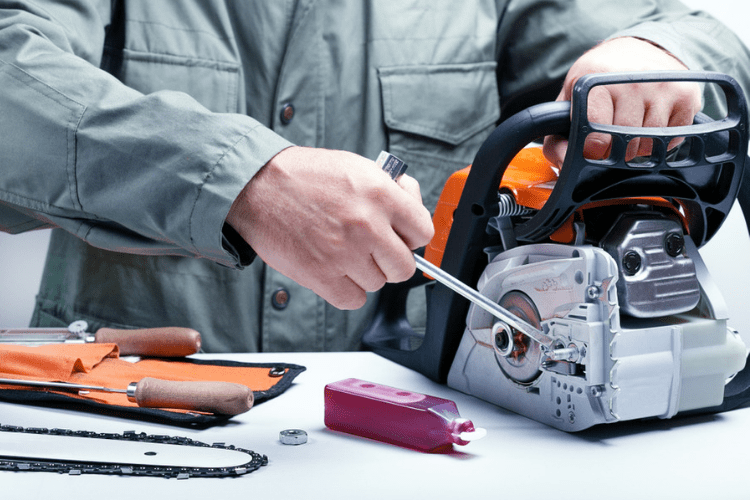 Despite their danger as a power tool, chainsaws are also relatively safe machines when handled properly. There are four main parts of a chainsaw to become familiar with. The bar, the chain, the handle and the chainbreak. These are also the parts of the saw most directly involved with its safe handling and use. The chain rides in the bar, which as a unit is controlled by the chainbreak. The chainbreak is a handle that immediately stops the chain from rotating when it’s tripped. Disengage the break by pushing it forward. Always start chainsaws with the chain break engaged. Achieve this by pushing it away from you until you hear a click. Now you’re ready to start your saw. There are two universally-approved methods for starting a chainsaw. The first method is achieved by placing the saw on the ground and standing with one foot inside of the handle while pull starting. This prevents the saw from moving unpredictably in the starting process. The second approved starting method is to cradle the saw body between your legs while pull starting. Both of these methods negate the danger of having a saw start unpredictably, hit the ground and kick up towards the user. Locate your saw’s choke switch, set it to a full-choke, and use the pull start cord until the engine turns over. Next, set the choke to either half choke or the start position and start the saw. Yard work can be one of the messiest and most dangerous implementations for a chainsaw. Often times, clearing brush and removing trees in overgrown yards involves working on uneven ground and running the saw in tangled and complicated situations. All of these factors can conspire to cause you bodily harm, unless you’re being diligent. The riskiest part of a saw is the very tip of the bar. This is commonly referred to as the “kick zone”, and using this part of the bar and chain will almost always result in a kickback, which is an unpleasant, if not dangerous, experience. When the tip of the bar comes into contact with wood, the chain is rotating too fast and reacts by springing up at the user. Typically, in a level and uncluttered work space, avoiding contacting the tip of the bar is easy. However, when your project demands more industrious clearing and saw operation, it becomes easy to lose the tip of the saw in your work. Always strive to be cognizant of where your saw is running at all times. Hold the top handle of the saw with your non-dominant hand in a prepared and flexed state. In the event of a kickback, this will help you resist getting hit. Also avoid centering the chainsaw on your body. In the event of an uncontrollable kickback, the bar will clear your head and body to either the left or the right. Most likely, the majority of the trees you will nominate to remove from your yard will be small or young trees that have “volunteered” from the roots of another existing mature tree. Removing these trees doesn’t require a typical notch technique which is harder to master, and can instead be taken down with a simple snap cut. Some of the standard steps in this process are consistent across all forms of tree removal, particularly the pre-cut safety inspections. Determine which direction the tree is leaning. This will dictate the location of your cuts on the trunk. For the most part, saw operators will choose to drop a tree in the direction that it is already leaning. Next, determine where your escape path will be in the event of the tree not falling in the predicted direction. Choose a path that is 45 degrees off the back of the tree either to the left or the right. The snap cut is a standard tool for most arborists, and is very easy to learn. Kneeling behind the tree, make a bottom horizontal cut facing the direction of the tree’s lean. Cut about half way into the tree. Then, pull the saw out of the cut, bring the bar behind the tree, and make a second cut about two inches above your face cut in the same direction. The two cuts should bisect near the center of the tree’s mass. The wood left in-between these cuts is called the “holding wood”. Depending on the size of the tree, you should be able to remove your saw, shut it down, and push the tree over. Watch as the holding wood “snaps” before the tree topples. Keep in mind that simply reading a blog isn’t a replacement for hands on saw training. But thanks to this post, you should be a little more prepared to tackle some yard projects with your new chainsaw.